Just earlier today (9/5/2012), Lady Gaga finally announced her US tour dates including two NYC shows: one at Madison Square Garden in Manhattan and a second show in the new Barclays Center in Brooklyn. We’ve been tracking Lady Gaga’s BTW tickets — as well as her South African adventure & fan art — for months now and are pumped to finally see some concrete details coming in on her US shows. Check out ticket and show details below and let us know in the comments if you have any questions. 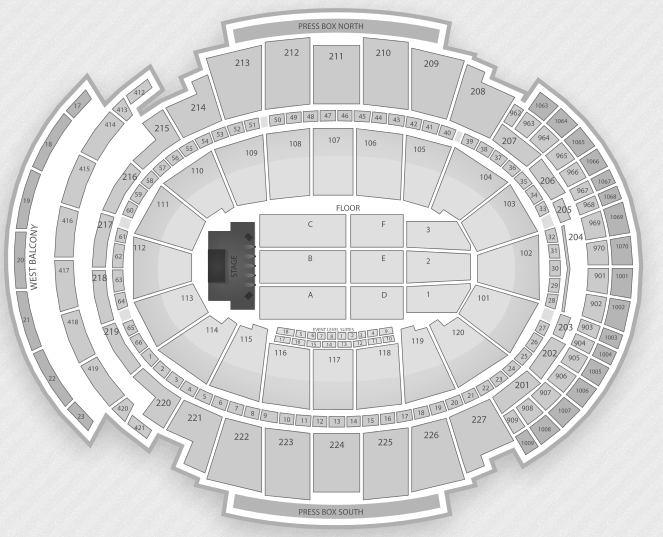 This is a generic concert seating chart for the event, we’ll update this as soon as the specifics of her MSG stage positioning are released. One interesting wrinkle is that Gaga will also be performing at the newly constructed Barclays center where other top acts like Jay-Z, The Rolling Stones and Barbra Streisand will also be performing in 2012-13. Note that the Newark show (not a far train ride from Manhattan) was significantly lower (~20%) in price than the NYC-proper shows. We’ll keep you updated as soon as Gaga releases more details about her US shows and when tickets will become available, we to our wondering when tickets will go on sale for Lady Gaga tickets in NYC.